The proud papa isn’t able to pass out cigars, but there was still plenty of celebrating at the Cincinnati Zoo, where earlier this month a giraffe has been born for the first time in 26 years. Tessa, a four-year-old Maasai giraffe, delivered the calf at 9:40am on April 2, and 20 minutes later the tyke (who was later identified as a female, and whose name “Zuri" was selected via a Facebook contest) was tentatively balancing on her wobbly legs and nursing. Birthing a six-foot-tall baby with four sharp hooves sounds unbearably painful to any human who has demanded morphine seconds after her water has broken, but it’s just one of many inconveniences the world’s tallest animal has adapted to over the centuries. Without access to the animal’s DNA, the second-best way to identify different types of giraffes is via the distinctive markings on their coats. There are nine recognized sub-species of giraffe, and for the most part each group keeps to themselves in specific geographic regions of Africa. However, Kenya has the unique distinction of being the only country that is home to three giraffe species – the Masai, the Reticulated and the Rothschild. Masai giraffes (left below) have irregular brown patches with jagged edges on a cream-colored background. Their Reticulated cousins (center) boast very clearly defined orangey-brown patches separated by bold white lines. And the Rothschild family (right) sports light, irregular patches (those less jagged than those of the Masai) on a white-to-buff background, with no markings below the knees. The giraffe is the world’s tallest animal, and as a result requires a lot of extra help to pump the blood all the way to its head. Their extra-large hearts weigh about 25 lbs. and pump fast enough to keep their central arterial blood pressure at 250 mmHg (compared to 100 mmHg in humans). Under normal conditions, that would result in a pressure of 400 mmHg in the legs (in simple terms: severely swollen ankles), but the giraffe has a secret weapon - the skin on its legs is extra thick and extremely tight-fitting, and it prevents the blood vessels from expanding and the blood from pooling. As they walk, their leg muscles help to vigorously pump the blood back upwards to the rest of the body. In case you’ve wondered why giraffes don’t pass out from the head rush when they bend their heads down to drink, it’s because of the rete mirabile – a complex web of arteries, veins and valves that carefully regulate the blood flow to their noggins. The average giraffe’s tongue measures from 18 to 20 inches long. It’s also a blue-ish/purply color, but that’s not important right now. Despite the length of its neck, sometimes the tastiest acacia leaves (a staple of the giraffe diet) grow on the uppermost branches of the tree, so the giraffe needs those extra inches its prehensile tongue provides to reach up and grab those tender leaves, which provide not only nutrition but also much-needed moisture. The giraffe’s only natural predator is the lion, and the giraffe is most vulnerable to a lion ambush when it assumes the very awkward spread-legged position necessary to drink water from ground level. Eat enough moist acacia leaves and trips to the local watering hole are reduced proportionately. Some scientists postulate that the reason a giraffe’s tongue is a darkish color is to prevent sunburn, since it spends a large portion of the day outside of the animal’s mouth and exposed to the hot rays of the African sun. But evolutionary theories aside, scientists do agree that not only is the giraffe’s tongue extraordinarily “tough” – that is, it sustains surprisingly few cuts from the thorns found on acacia branches – it is also protected from infection from the few abrasions it does sustain by some very thick, very antiseptic saliva. That same saliva coats the thorns so thoroughly that they exit the animal in their original form, with no harm done to the digestive tract. Giraffes also capitalize on the antiseptic and prehensile qualities of their tongues by using them to (yech!) routinely clean their ears. Can an 18 foot tall animal equipped with a lethal kick be considered “cuddly”? Ask anyone who has stayed at Kenya’s Giraffe Manor, a small hotel located just outside of Nairobi. The Manor was originally constructed in 1932 as a hunting lodge by an heir to the Mackintosh Toffee fortune. The property was sold to Betty Leslie-Melville and her husband in 1974, and shortly after their purchase the Leslie-Melvilles found out that the few remaining Rothschild giraffes were in danger of being exterminated thanks to the sale of the animals’ sole habitat by the Kenyan government to a private real estate company. 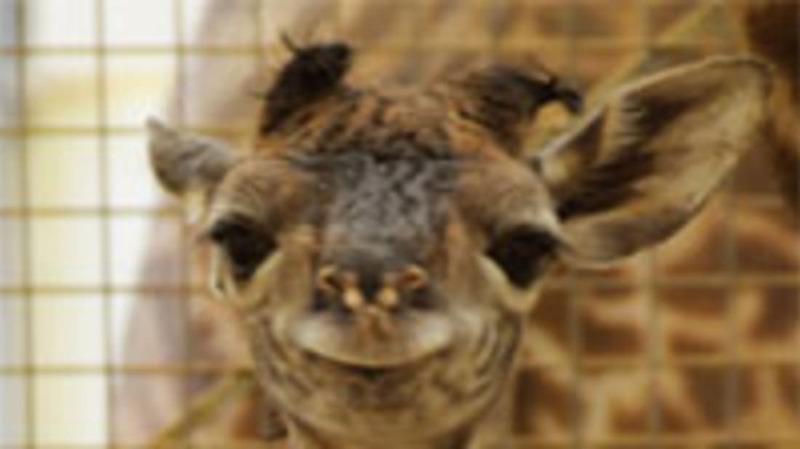 The Leslie-Melvilles, who already had three Rothschild giraffes roaming on their property, agreed to “adopt” two other giraffes who were slated for slaughter. In 1983 the family refurbished the lodge and re-opened it as a hotel. Since that time Giraffe Manor has worked with several wildlife groups in the breeding of Rothschild giraffes and re-introducing them into the wild to expand the gene pool. They fund their efforts via the hotel guests who willingly share their breakfasts with the Manor’s giraffes who quickly learned the meal schedule and are always sure to stick their necks in through a window to beg a tidbit. Giraffe Manor is still operating today in case you’re ever in the vicinity; some of the celebrities who’ve noshed with the long-necked over the years include Johnny Carson, Mick Jagger, Brooke Shields and Walter Cronkite.